Who says Valentine's Day has to be about the boys? Let's have a girls-only tea party. Boys are great and all, but sometimes you just need some girls-only time, right? I read in The Happiness Project that both men and women report greater feelings of happiness and satisfaction after having a conversation with another woman. Let's nourish the female relationships in our lives! 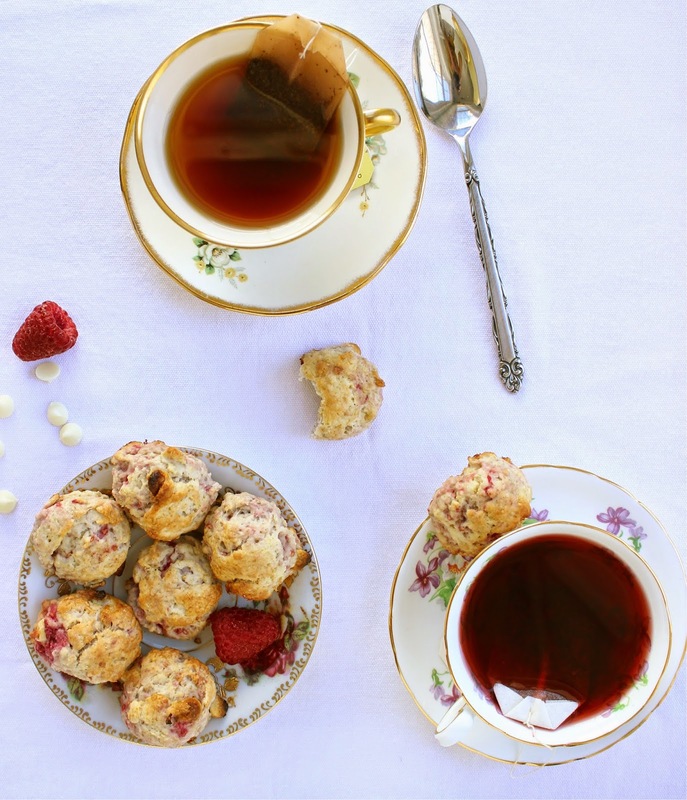 A tea-party with these scones is a good place to start. There's a special story behind these teacups. Late last summer I had high tea at the Carolina Inn with my friend Tori and her mom. As we nibbled on tea sandwiches and sipped rose tea, I mentioned how much I loved the mismatching vintage teacups. Then, this past December for my birthday, Tori surprised me with 4 vintage tea cups, including one from her grandmother's collection!! I have the most thoughtful friends. 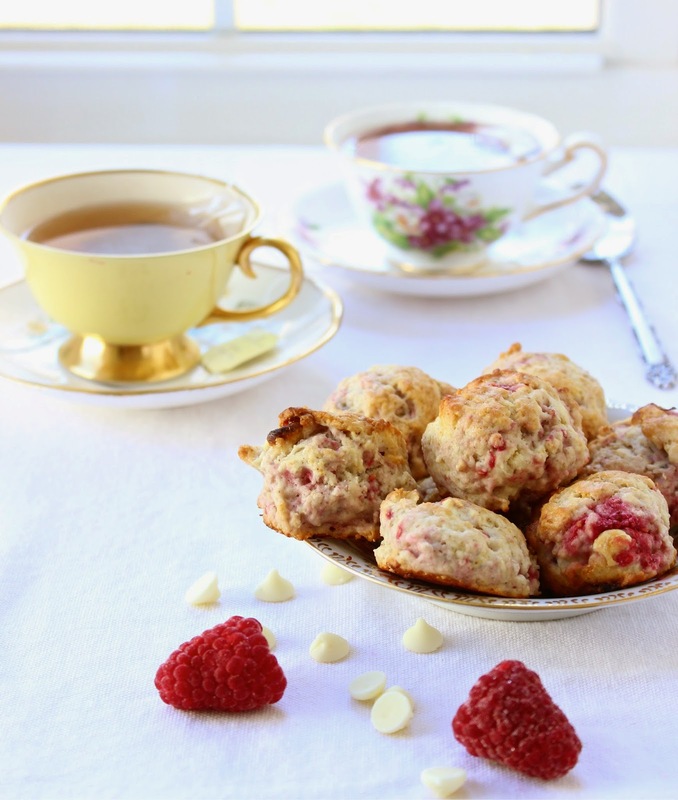 Until now, I thought my favorite scones were these whole wheat apple cinnamon ones, but these mini raspberry white chocolate scones are also pretty fantastic. While most scones are made with buttermilk and butter, this recipe just uses heavy cream. The raspberries and chocolate are a dream combination here, and the ginger and cinnamon add depth of flavor and transform these from ordinary--> extraordinary. In addition to any date plans you have next Saturday, consider having some one-on-one time with your girlfriends. 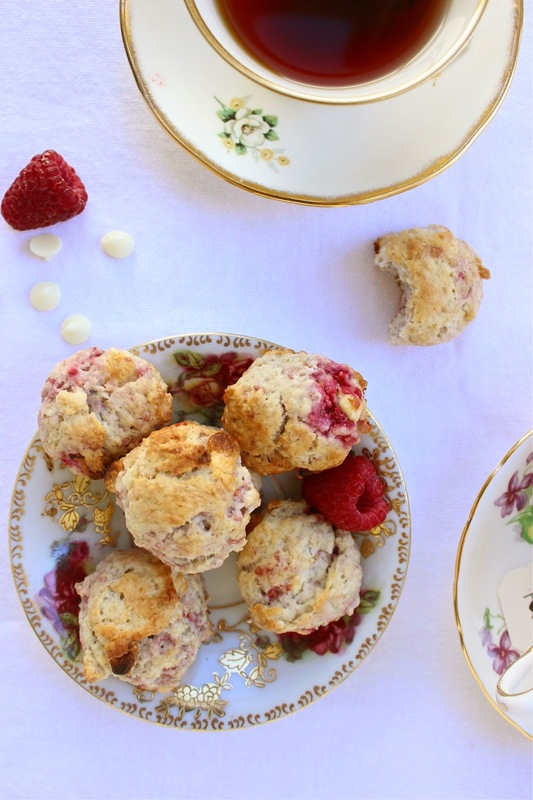 Make them these scones or another treat to remind them how special they are to you. Hope you have a love-filled week, friends! Preheat oven to 425. Line a baking sheet with parchment paper or spray liberally with non-stick cooking spray. Clean a space on your counter and lightly dust with flour. In a medium bowl, whisk together flour, baking powder, salt, and sugar. Measure heavy cream into a large class measuring cup. Add vanilla extract and stir to combine. Gradually add the cream & vanilla to the flour mixture, stirring as you pour it in. The dough will be craggy. Continue stirring until combined. Add the white chocolate chips and frozen raspberries and stir to incorporate. Add another tablespoon or two of heavy cream if necessary. The dough should just come together, but should not be sticky. Roll dough out onto cleaned, floured surface. Use your hands to gently flatten dough out into a rectangle/oval of 3/4 thickness. Use a biscuit or cookie cutter (or a cup or a jar) to cut out desired scone size. Place on baking sheet. 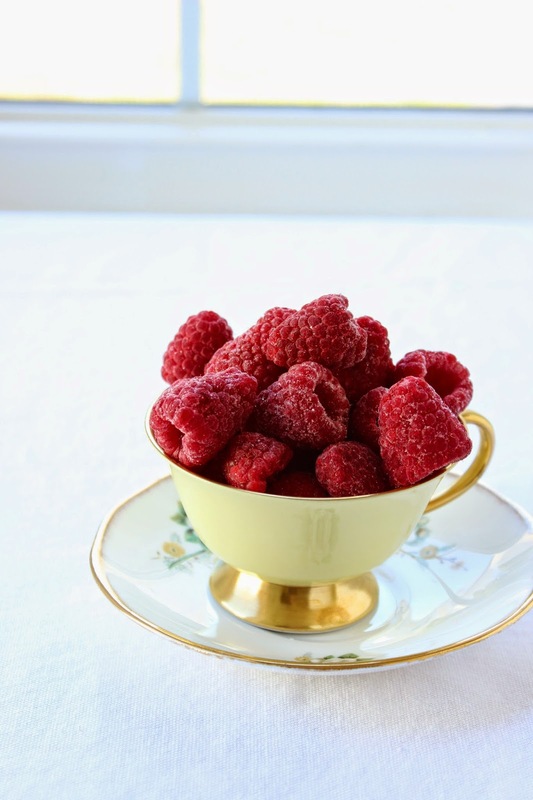 The raspberries will melt a little as you work--that's ok! Brush scones with heavy cream. If desired, sprinkle with coarse sugar. Bake at 425 for 12-14 minutes or until tops are just staring to brown. Can I come to this tea party? These scones sound absolutely amazing!!! Also, the next book on my pile to read (I have a whole stack that i'm slowly inching through) is The Happiness Project, I cannot wait! I love the.boy, but honest I feel like I would much rather make plans with my girls on V Day! But those plans had better involve these scones. When do you put the raspberries and chocolate chips in?? Hi Candace--I'm sorry that I forgot that step in the recipe. I just fixed it! You add the raspberries and white chocolate chips after adding the cream and stirring to combine.